It’s January, the month of resolutions, especially those diet-related ones. Most want to lose weight and get fit. To that end we got a variety of diets and fads that pick up. Some want to go Paleo or low-carb. Other misguided folks are still on the low or no fat bandwagon. Really ambitious dieters try their hand at a whole new lifestyle like vegetarian or vegan! In most cases it will all fade away in a few weeks and we are back to eating a lot of all the “wrong” stuff. Well, I have no resolutions. I think they are silly and any claims of THE ONE DIET are ultimately useless and discouraging. That being said, we tried to take it easy this January since between November and December, the holidays and trips to Maine and Boston, we had a lot of rich carb-heavy food. Several nights in this month we went with a “salad” of some sort. Some were good straight-forward ones but nothing to document. Others were delicious, beautiful, satisfying and nutritious that were worth putting up here. Here is the first of the “January Trilogy” of light dinners. I had a few large chicken hind quarters from Yonder Way Farm. These are delicious for braising or very slow roasting on the grill or oven. In this case though I divided the drumstick from the large thighs. For this dish I de-boned the thighs and laid them flat on a cutting board as I rummaged in my fridge (I slow baked the drumsticks and slathered them in barbecue sauce if you must know). As is my habit most times, I ended up with an Italian flavor profile for the chicken thighs. After seasoning them with salt I rolled them with garlic, shallots, rosemary, oregano and lemon zest into neat cylinders. These chicken thighs are from free range birds and they benefit from longer cooking. So, I cooked them sous vide at 66 C for about 4 hours. They were tender and perfectly juicy. While the chicken cooked I roasted a cubed butternut squash along with a few cut up carrots. When the chicken was done, I patted them dry and browned the skin in the pan with olive oil till crispy. I made a nice warm sauce/dressing for the dish using reduced white wine with shallots. I added Dijon mustard and enriched it with creme fraiche and some of the reserved cooking juices from the bag. I still had one shoulder left (I used the other one here) from the deer my neighbor gave me. I wanted to use it in a preparation that capitalizes on the good berries available in stores right about now. 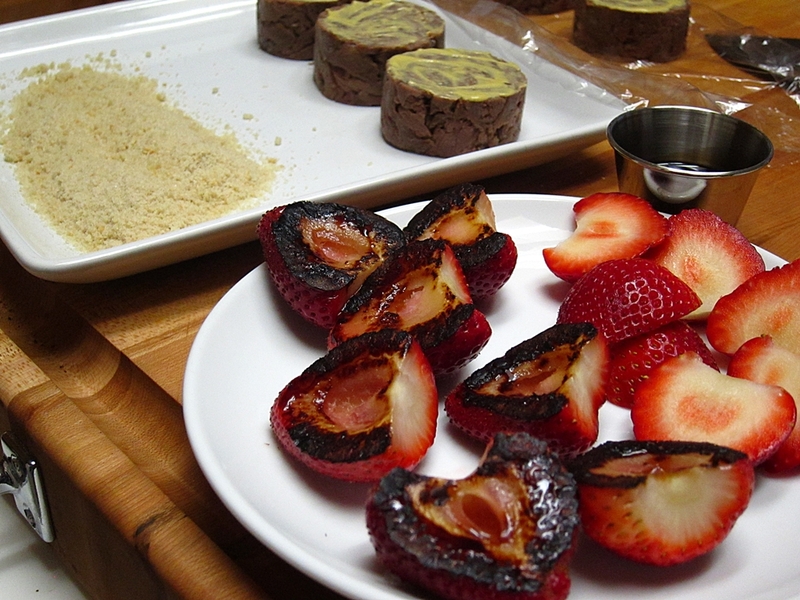 On the Alinea-Mosaic site I was reading about a dish they are working on and the chef incorporated strawberries, both raw and charred. They served the charred strawberries with squab, so venison made sense to me. All the preparation that the strawberries needed was to slice them, brush them with very little grape seed oil and very quickly char them in a hot pan. 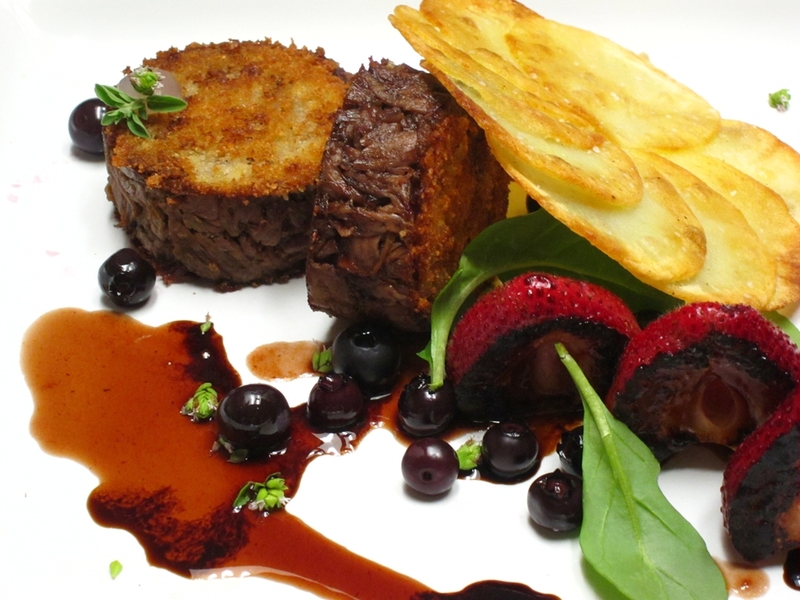 The venison was done confit style like the previous one. For this shoulder I used both orange and lemon zest in the cure in addition to cinnamon sticks and brown sugar. To cook it, I rubbed it with duck fat and vacuum packed it, then cooked it sous vide at 180F for 20 hours. I wanted to melt all the collagen since I was going to use the liquid in the bag as a binder for the “venison log” later on. In hindsight, probably a bit less time would’ve been fine, closer to 12 hours. The meat was falling off the bone, so I shredded it and de-fatted the liquid in the bag. I then reduced the liquid to about 1/3 of a cup and mixed most of it into the meat. I also stirred in a few tablespoons of sherry vinegar to liven up the flavor. The meat mixture was tightly wrapped in plastic wrap into a tight roulade and popped in the fridge to set and firm up. For service, I sliced the log into 2 inch thick slices, smeared one surface with Dijon mustard and coated it with regular bread crumbs. These disks were then pan-fried till crispy in olive oil. For a starch I made Pommes Maxim, the recipe for these cool looking potatoes is from Thomas Keller’s Under Pressure. They are a bit tricky to make and need some patience, but are well worth it. 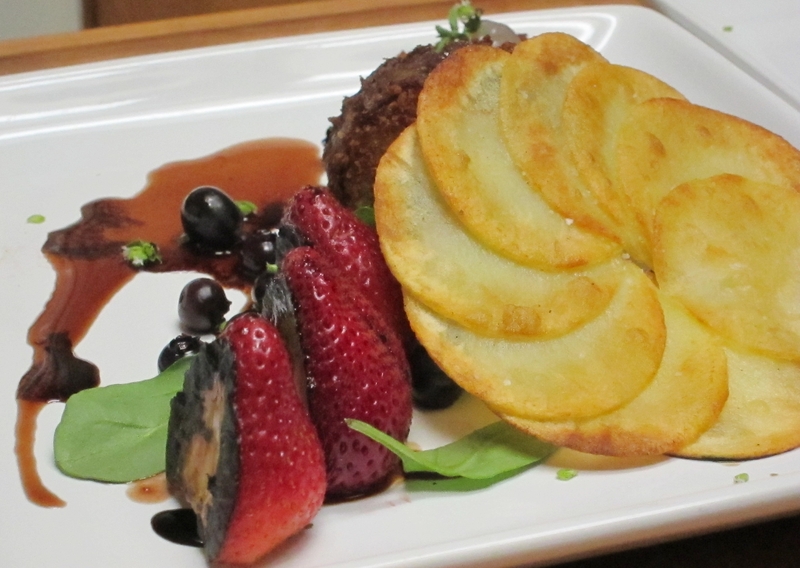 The potato is sliced thin on a mandolin, then the slices are cut into circles with a pastry cutter. 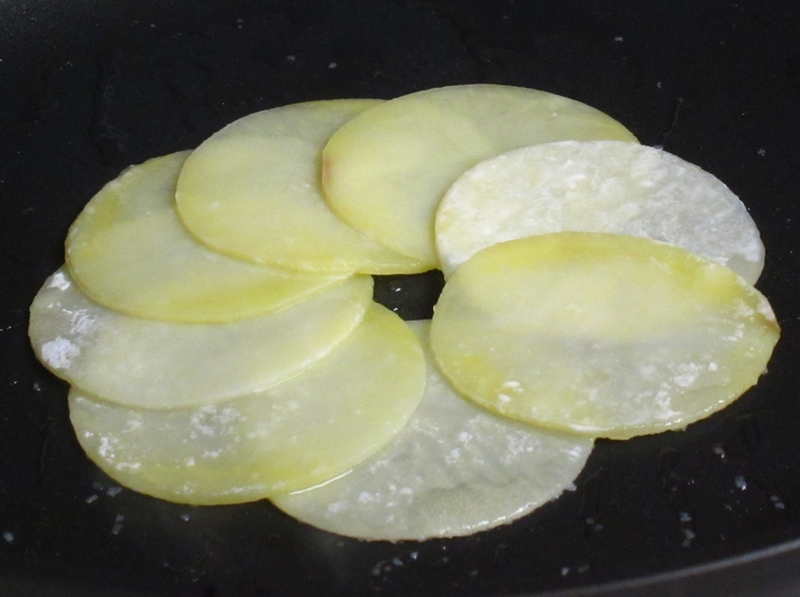 After a quick blanch in salted water, the potatoes get coated in corn starch and arranged on parchment circles in a concentric overlapping shape. These can happily sit in the fridge for a day or so now. Right before serving, I pan-fried the potatoes in clarified butter until golden, crispy and delicious. These are very delicious! For a sauce I made pickled blueberries and a blueberry gastrique. 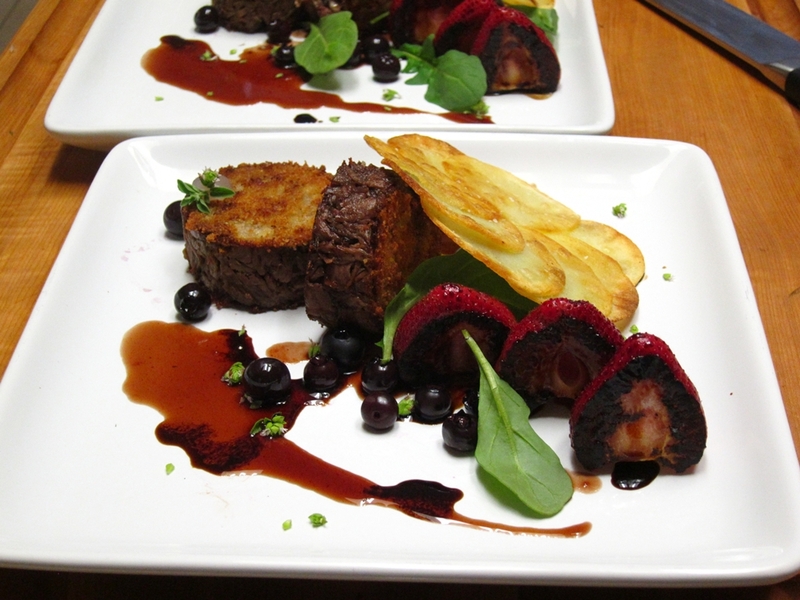 The recipe is from Alinea where they serve it with bison. The berries are cooked in a mixture of red wine and sugar, then left to macerate for a couple of hours before being removed. The blueberry flavored mixture is mixed with venison stock that I made a couple of weeks ago from the same deer. That sauce is reduced to a syrupy consistency and the flavor adjusted using some of the leftover liquid from the venison bag. The sauce is a little tart, sweet and very deeply flavored. For a slightly sharp and different flavor I made a eucalyptus pudding, again based on an Alinea recipe and is made following their standard method of setting a mixture with agar and then pureeing in a blender for a pudding-like texture. I used a fraction of the recommended amount of eucalyptus oil and the pudding was pretty damn strong. It’s worth noting that Diana was not crazy about this component, so I am glad I only used a little bit of it as a dollop on the venison disks and a few drops as a base for the strawberries. To finish the dish, I garnished it with a few arugula leaves, drops of reduced balsamic vinegar and fresh oregano leaves and flowers. This was a very tasty and wonderful looking plate of food. 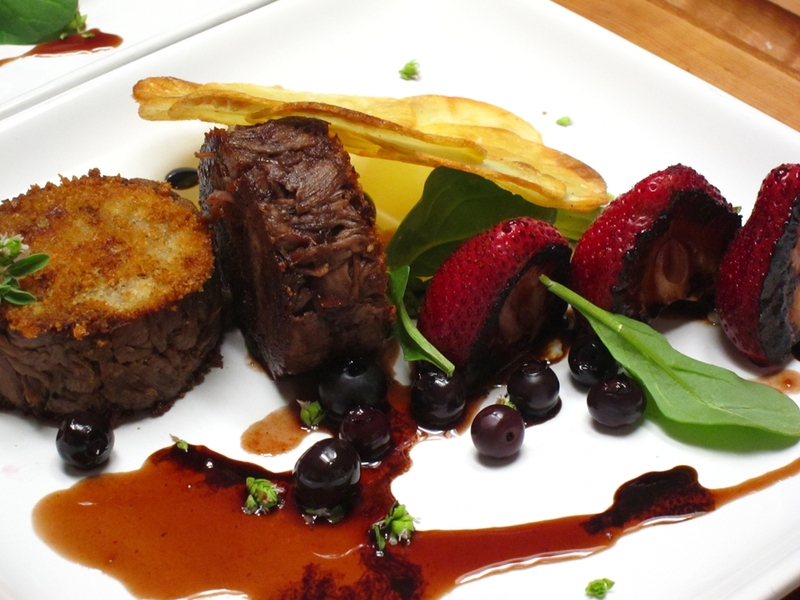 The tart sauce and the berries worked very well with the rich and unctuous venison. The arugula and balsamic reduction brightened the flavors even more and worked with the blueberries to contrast the richness of the dish. Did I say the Pommes Maxim were delicious already? They were and we could barely keep the kids away from eating all of our portions of what they called potato chips.